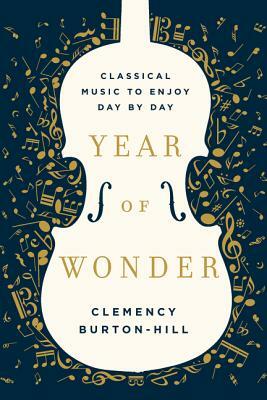 Year of Wonder introduces readers to one piece of music each day of the year, artfully selected from across genres, time periods, and composers. Burton-Hill offers short introductions to contextualize each piece, and makes the music come alive in modern and playful ways. From Bach, Beethoven, Mozart, and Puccini to George Gershwin, Clara Schumann, Philip Glass, Duke Ellington, and many remarkable yet often-overlooked voices, Burton-Hill takes us on a dazzling journey through our most treasured musical landscape. Thoughtfully curated and masterfully researched, Year of Wonder is a book of classical music for everyone. Whether you’re a newcomer or an aficionado, Burton-Hill’s celebration will inspire, nourish, and enrich your life in unexpected ways. Clemency Burton-Hill is a leading host on BBC Radio 3 and other music and arts programs on radio, television, and online. She regularly contributes to the Observer, the Economist, 1843 Magazine, FT Weekend, the Guardian and the Telegraph. She is also a classical music columnist for BBC Culture. An award-winning violinist she has performed all over the world under leading conductors including Daniel Barenboim. She is the co-founder of Aurora Orchestra and a patron of the music and arts education charities The Choir of London Trust and Dramatic Need. She lives in London.